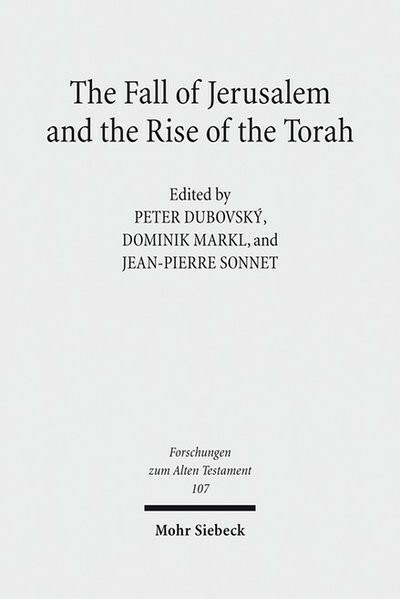 Produktinformationen "The Fall of Jerusalem and the Rise of the Torah"
The destruction of Jerusalem by the Babylonians in 587 bce is arguably the most tremendous disaster in the Hebrew Bible. How this decisive date relates to the development of the Pentateuch, however, is highly controversial. Is the trauma of Jerusalem reflected in the five books of Moses? This question is addressed from multiple perspectives in this volume. Israel Finkelstein and Lester L. Grabbe discuss the archaeological and historical data. Experts in Pentateuchal criticism from diverse international backgrounds present a rich panorama of relevant themes, including biblical historiography, contacts with Mesopotamian culture before and during the Babylonian exile, and the issue of cultic discontinuity caused by the destruction and restoration of Jerusalem's temple.Contributors:Angelika Berlejung, Peter Dubovský, Israel Finkelstein, Georg Fischer, Lester L. Grabbe, Ronald Hendel, Bernard M. Levinson, Nathan MacDonald, Dominik Markl, Christophe Nihan, Eckart Otto, Konrad Schmid, Jean Louis Ska, Jean-Pierre Sonnet, Jeffrey Stackert, Nili WazanaDominik Markl SJ, geboren 1979, wuchs in Sistrans bei Innsbruck auf und ist seit seiner Jugend ein begeisterter Bergsteiger. Er studierte Theologie und Bibelwissenschaft in Innsbruck, Jerusalem und München, arbeitete als Jugendseelsorger in Wien und lehrt derzeit Altes Testament am Heythrop College, University of London. Unser Kommentar zu "The Fall of Jerusalem and the Rise of the Torah"